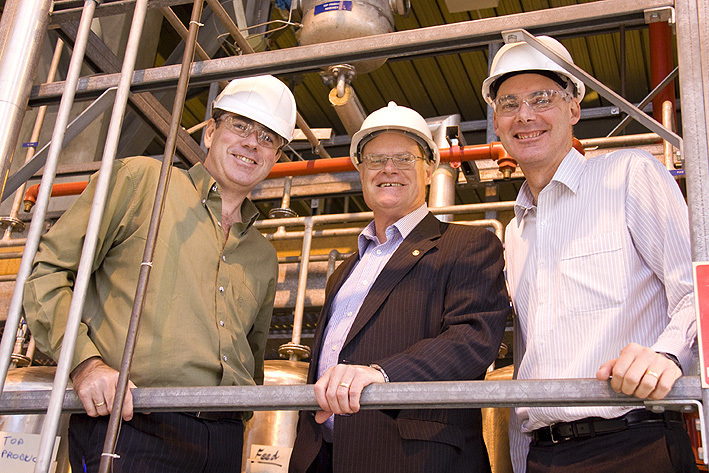 CET/School of Chemical Engineering have recently been awarded $460,000 in ARC Linkage funding. Dr David Lewis and Associate Professor Peter Ashman from the CET/School of Chemical Engineering were awarded $460,000 in ARC Linkage funding for their project: “Energy from microalgae: industrial scale development and downstream processing of co-products”. This was the biggest grant won at the University of Adelaide in the latest round announced yesterday. In partnership with South Australian-based technology development company SQC Pty Ltd and Flinders University, Dr Lewis and colleagues will develop processes to produce renewable energy from microalgae grown in open saline ponds. “Our work will lead to the sustainable production of commercial quantities of clean biofuels,” Dr Lewis says. This entry was posted in CET, Grants, News and tagged ARC Linkage Grant; funding, CET; Centre for Energy Technology, microalgal energy, renewable energy; energy. Bookmark the permalink.